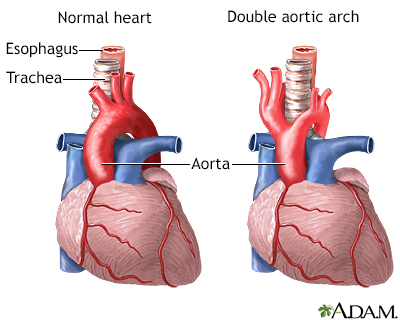 Double aortic arch is an abnormal formation of the aorta -- the large artery that carries blood from the heart to the rest of the body. The aorta splits into two vessels instead of one soon after it leaves the heart and surround the esophagus (swallowing tube) and trachea (breathing tube). The two branches eventually come back together.